The Women’s Air Vest contours nicely to the body. Photo: Gaye Camm. I love how useful a good fitting vest can be. 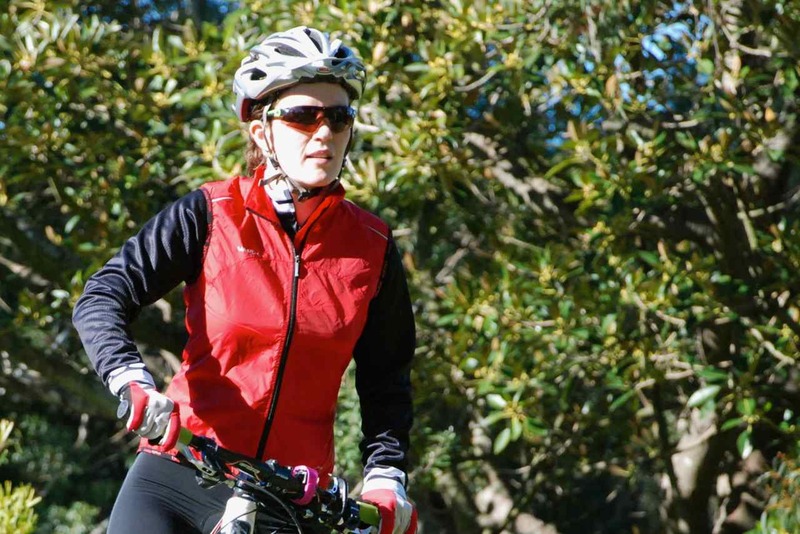 During mid-season riding and cold season racing the wind blocking properties of a well made vest are the difference between a ride thoroughly enjoyed, and a ride wishing you were inside next to the heater. I have owned a few vests in the past, but they have all been men’s designs. This has meant that while the garment has blocked the wind, it has also puffed up like a parachute, or crept up my midriff in the process, which is neither fast nor particularly glamourous. The Vaude Women’s Air Vest contours nicely to the female form and also includes some other thoughtful features which keep it there. Great on short punchy rides or all day epics. Photo: Duncan Miller. The Air Vest is made from a very light weight, windproof, water resistant material. It has elastic around the waist and arm holes to keep it in position, while adding a nice stretch when you are maneuvering the bike around the trails. Its bright colour, reflective strips, and zippable rear pocket add to its functionality, while a soft colar, glove friendly zip, and ability to pack down to the size of my palm make it very user friendly indeed. The feature I find most intriguing is the mesh panel on the back of the vest. Not only does it allow good airflow (with zero Michelin Man aftermath), but the mesh also stretches with the body, keeping the vest feeling how a good fitting vest should – completely unnoticeable except in photos! Rear view. 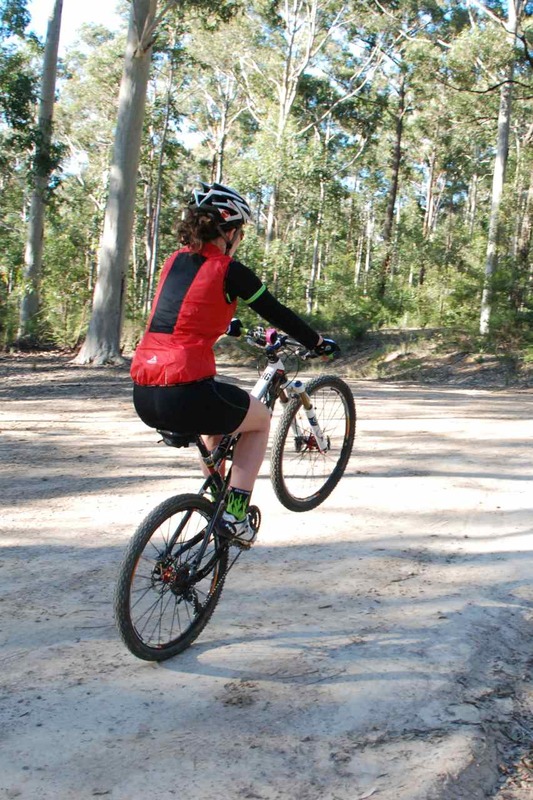 And proof that girls CAN do wheelies! Photo: Duncan Miller. Thank you enormously to Rucsac Supplies/Vaude Australia for their continued support. The general rule with cycling equipment is that out of light weight, longevity and affordability, any given product will generally only tick two out of the three options. The Vaude gear I’ve been using over the last few years continues to tick all three making it a joy to use and easy to recommend. 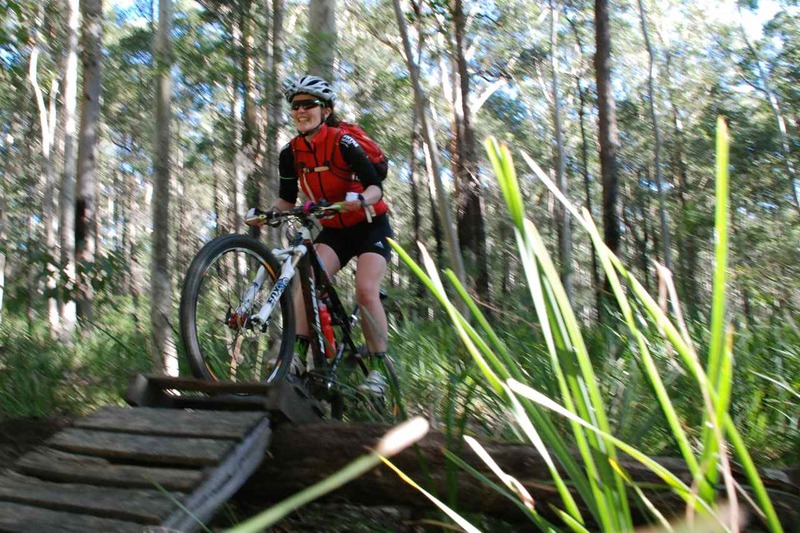 Thank you also to Gaye Camm and Duncan Miller for the photos and trail rides. Winter just keeps getting better!